1. 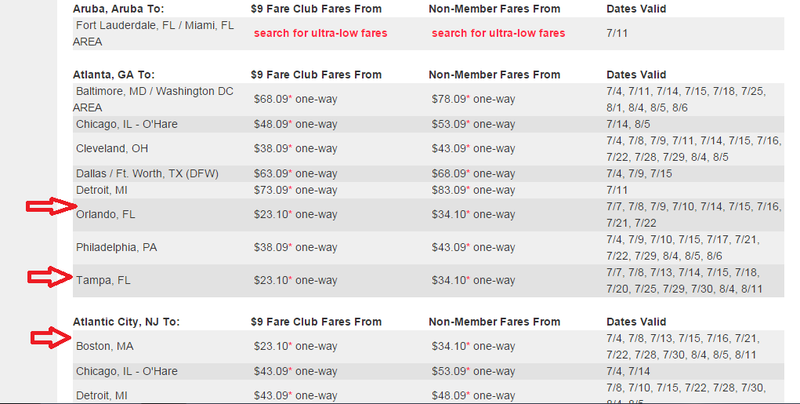 Spirit Airlines has one way-fares for $23-$34 each way for select dates on many of their routes in July and August 2015. However, you need to act fast and make your reservation by tonight i.e. by 11:59 pm on June 30th. We are in Richmond, VA and I like the fares from Baltimore/Washington DC to Chicago for $53-$58 one-way. Also, you can get to Orlando from Atlanta each way on select dates next month,. All fares must be booked on spirit.com by 11:59PM on June 30, 2015 for travel on the dates as specified by individual market and by market direction on nonstop flights only. Fares valid on select dates in July 2015 and August 2015. Fares are based one-way. Fares may be combined with other valid and applicable Spirit Airlines fares on other dates of travel. Lower fares generally available at the airport and all fares are subject to availability. You must be a member of the $9 Fare Club to receive the member fares. To become a member of Spirit Airlines $9 Fare Club, click here for membership details and Terms and Conditions. Not all markets are operated on a daily basis during the travel period, or necessarily for the entire travel period — please see http://www.spirit.com for details.